The generic term oral streptococcus is used with caution since many of the species listed may also be found in the gastrointestinal and genitourinary tracts. (human), rarely found in humans. a Proposed correction to epithet (Truper and de'Clari, 1997, 1998). 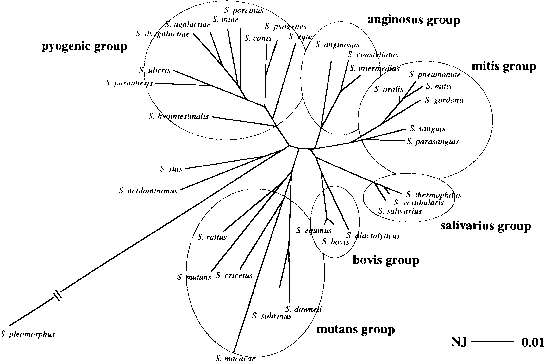 b S. sanguis group separated from larger S. mitis group by Facklam (2002). streptococci is caused by well-characterized haemolysins (see Chapter 1), whereas the a-haemolytic reaction on blood agar plates results from the production and release of hydrogen peroxide by streptococcal colonies grown under aerobic conditions that causes oxidation of the haeme iron of haemoglobin in erythrocytes (Barnard and Stinson, 1996, 1999). Differences exist in the haemolytic reaction within species, and the reaction is dependent on culture conditions and the origin of the blood incorporated into the agar. Porcine aThe epithet equinus has nomenclatorial priority; however, the epithet bovis remains widely used in the medical literature. b Rarely found in humans. metabolic studies, numerical taxonomy and genotypic analysis such as DNA-DNA hybridization, DNA base composition [mol% guanine + cytosine (G + C)] and comparative sequence analysis of small subunit (16S) ribosomal DNA (reviewed by Facklam, 2002). This latter technique was used to subdivide the genus Streptococcus into six major clusters that broadly conform to the results of previous taxonomic studies (Kawamura etal., 1995a) (Figure 2.1). To further complicate matters, a taxonomic note by Truper and de'Clari (1997, 1998) called for grammatical corrections in the Latin epithets of four streptococcal species, among 20 species. For the sake of clarity, where the epithets sanguis, rattus and crista have been used in the scientific literature for over 30 years, we have chosen to retain the historical nomenclature throughout this chapter (Kilian, 2001). These streptococci are common members of the oral flora and are found in the gastrointestinal and genital tracts and are clinically significant owing to their association with purulent infections in humans. The classification of these streptococci was confused for many years, and the term Streptococcus milleri has been used for a biochemically and serologically diverse collection of streptococci, despite not being accepted by taxonomists as a confirmed taxonomic entity. The weight of evidence from nucleic acid studies currently supports the recognition of three separate, albeit closely related, species - Streptococcus anginosus, Streptococcus constellatus and Streptococcus intermedius - and these have been published with amended species descriptions (Whiley and Beighton, 1991; Whiley etal., 1993). Isolates of S. intermedius rarely have Lancefield group antigens, whereas isolates of S. anginosus and S. constellatus may have Lancefield F, C, A or G antigens. There are ß-haemolytic strains of each of the three species; however, these are outnumbered by the non-ß-haemolytic strains. Figure 2.1 Phylogenetic relationships among 34 Streptococcus species. Distances were calculated from the neighbour-joining (NJ) method. Reproduced from Kawamura etal. (1995a) with permission of the International Union of Microbiological Societies. causes of bacterial endocarditis. The application of nucleic acid studies has enabled some clarity to be derived for this taxonomically refractory group of oral streptococci. The mitis group as originally described by Kawamura etal. (1995a) included Streptococcus sanguis, Streptococcus parasanguis, Streptococcus gordonii, Streptococcus crista, Streptococcus oralis, Streptococcus mitis and S. pneumoniae (considered separately in Chapter 3). For several species, notably S. sanguis, S. oralis and S. mitis, combined taxonomic and nomenclatorial changes have been the cause of considerable confusion. Part of this confusion arose from the emphasis placed on the possession of Lancefield group H antigen, which was not well defined. Additionally, alternative nomenclature schemes have added to the confusion, particularly the use of S. mitior, a name traditionally assigned to an ill-defined species from the early days of streptococcal classification. The legacy of confusion that stems from a poor definition of the Lancefield group H antigen and the emphasis placed on its possession highlights the difficulties associated with the application of Lancefield grouping as a taxonomic tool for non-P-haemolytic streptococci. Three additional mitis group species have been described: Streptococcus peroris and Streptococcus infantis were isolated from the human oral cavity (Kawamura etal, 1998), whereas Streptococcus orisratti was isolated from the oral cavity of rats (Zhu, Willcox and Knox, 2000). Continued refinement and redefining of the mitis group of streptococci seem likely as the application of molecular taxonomic tools expands, and consequently it may be some time before we can fully correlate new and revised species in this group with human infections. The classification system proposed by Facklam (2002) and used in epidemiology reporting by the US Centers for Disease Control and by the Health Protection Agency in the UK has split S. sanguis, S. parasanguis and S. gordonii from the mitis group and placed them in a separate sanguis group on the basis of phenotypic characteristics. The division is used here for epidemiology reporting purposes, although 16S rRNA sequencing supports the taxonomic position described in Figure 2.1 (Kawamura etal, 1995a; Whiley and Beighton, 1998). Streptococcus salivarius is commonly isolated from most areas within the human oral cavity, particularly from the tongue and other mucosal surfaces and from saliva, though it is rarely associated with disease. This species is considered to be an important component of the oral ecosystem because of the production of an extracellular fructose polysaccharide (levan) from dietary sucrose and the production of urease by some strains. DNA-DNA reassociation experiments have revealed that S. salivarius is closely related to Streptococcus thermophilus, a nonoral bacterium from dairy sources, and also to an oral species Streptococcus vestibularis which is an a-haemolytic, urease-producing streptococcus that is found predominantly on the vestibular mucosa of the human oral cavity (Hardie and Whiley, 1994). Streptococcus vestibularis does not produce extracellular polysaccharide. The formation of a distinct species group by these three streptococci was confirmed by 16S rDNA sequence comparisons (Bentley, Leigh and Collins, 1991; Kawamura etal, 1995a). The mutans group of streptococci exclusively colonize the tooth surfaces of humans and certain animals and are associated with dental caries, one of the most common infectious diseases of humans. Their characteristics include the ability to produce both soluble and insoluble extracellular polysaccharides from sucrose which are important in the formation of dental plaque and in the pathogenicity (cariogenicity) of the organism. Following the original species description of Streptococcus mutans from carious teeth by Clarke (1924) and its isolation from a case of bacterial endocarditis shortly afterwards, little attention was paid to this species until the 1960s when it was demonstrated that caries could be experimentally induced and transmitted in animals. Similar caries-inducing streptococci were found in the dental plaque of humans, and from this point on, S. mutans became the focus of considerable attention. Studies revealed that isolates identified as S. mutans comprised a phenotypically and genetically heterogeneous taxon. Eight serotypes or serovars (designated a-h) have so far been identified, and six distinct species are currently recognized within the mutans group: S. mutans (serotypes c, e and f), Streptococcus sobrinus (serotypes d and g), Streptococcus rattus (serotype b), Streptococcus downei (serotype h), Streptococcus cricetus (serotype a) and Streptococcus macacae (serotype c). A seventh species initially included in the mutans group, Streptococcus ferus (serotype c), was shown to be only distantly related to all currently described streptococci, with no strong evidence to support its inclusion in this group (Whatmore and Whiley, 2002). Of these streptococci, S. mutans and S. sobrinus are commonly isolated from humans, whereas S. cricetus and S. rattus are occasionally recovered. Streptococcus hyovaginalis, isolated from the genital tract of pigs, is included in the mutans group because of similar phenotypic characteristics; however, identification from human sources has not yet been documented. Streptococcus bovis was originally described as a bovine bacterium causing mastitis. Strains described as S. bovis have been isolated from patients with endocarditis, and this species is also reported to be associated with colon cancer and inflammatory bowel disease in humans. Human S. bovis strains are divided into two biotypes based on their ability (biotype I) or inability (biotype II) to ferment mannitol. Despite the recognition of the clinical significance of this organism, its classification remains confused. Schlegel etal. (2000) described a new species isolated from human and environmental sources, Streptococcus infantarius, and have proposed that the S. bovis/Streptococcus equinus complex be reorganized into seven species or subspecies (Table 2.2) based on a combination of phenotypic, genetic and phylogenetic methods (Schlegel etal, 2003a). In this classification system, S. bovis biotype II.1 and S. equinus form a single genospecies. The epithet equinus has nomenclatorial priority; however, the epithet bovis remains widely used in the medical literature. Streptococcus bovis biotype II.2 isolates were reclassified along with Streptococcus macedonicus as Streptococcus gallolyticus. This clinically important group of bacteria, so named because of the need to supplement complex growth medium with cysteine or one of the active forms of vitamin B6 (pyroxidal hydrochloride or pyridoxamine hydrochloride) to obtain growth, forms part of the normal flora of the human throat and urogenital and intestinal tracts. 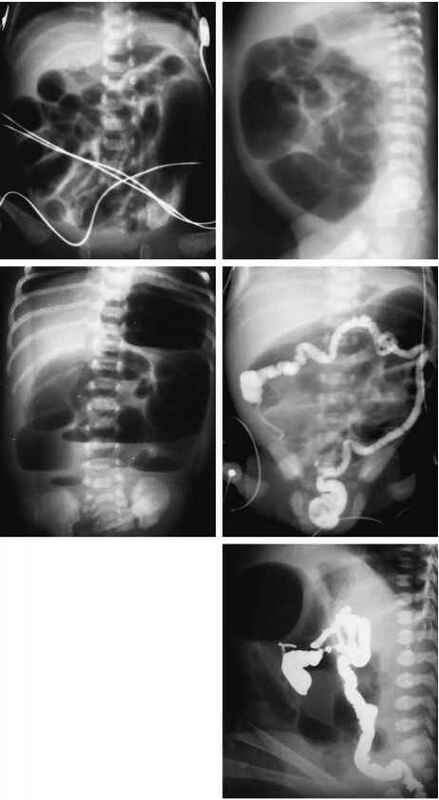 They are of clinical interest because of their association with infective endocarditis and other conditions including otitis media, abscesses of the brain and pancreas, pneumonia and osteomyelitis (Bouvet, Grimont and Grimont, 1989). The names Streptococcus adjacens and Streptococcus defectivus were first proposed by Bouvet, Grimont and Grimont in 1989 but were subsequently reclassified on the basis of 16S rRNA gene sequence data and other phylogenetic analysis within a new genus, Abiotrophia, as Abiotrophia adiacens and Abiotrophia defectiva, respectively (Kawamura etal., 1995b). Abiotrophia adiacens was subsequently transferred to Granulicatella adiacens (Collins and Lawson, 2000).